I love coconut macaroons. 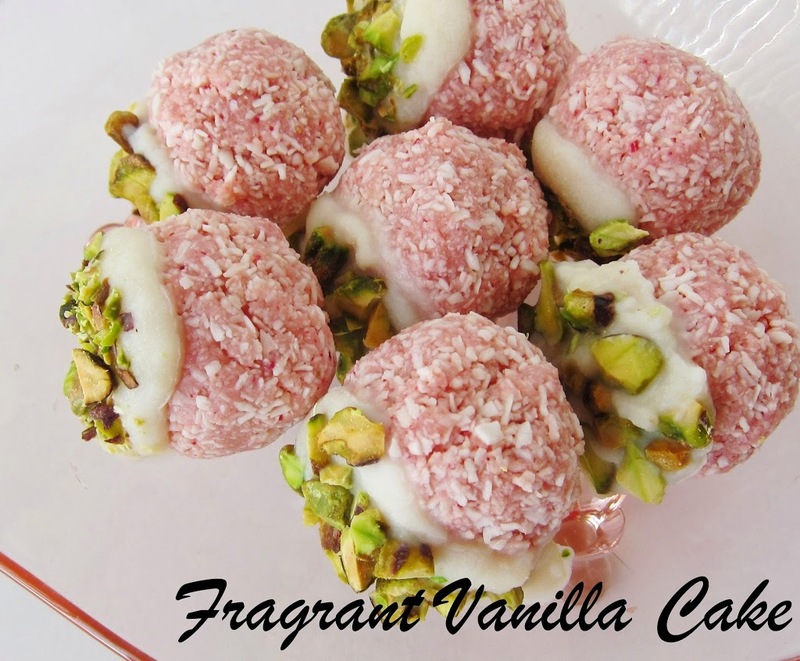 It is no secret, I have been making them quite frequently since I discovered how delicious the raw ones were a couple months back. I decided that I needed to make more last weekend and I wanted them to be festive for spring. I thought about many different possible flavors and colors they could be (like green for mint, purple for lavender etc. ), but what I landed on was rose. Lovely pink little macaroons with a beautiful scent. My favorite flavor of French macarons was always rose, so I thought it would be wonderful with the coconut. 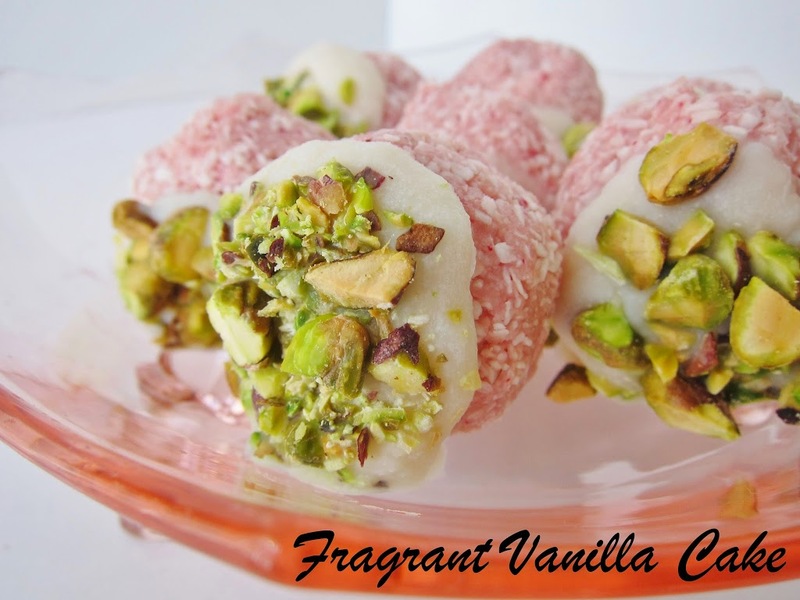 They were delicious on their own, sweet with the aroma of rose, but I thought I would make them even better by dipping them in a sweet coconut glaze (that actually tasted like white chocolate) and then dip them in pistachios. 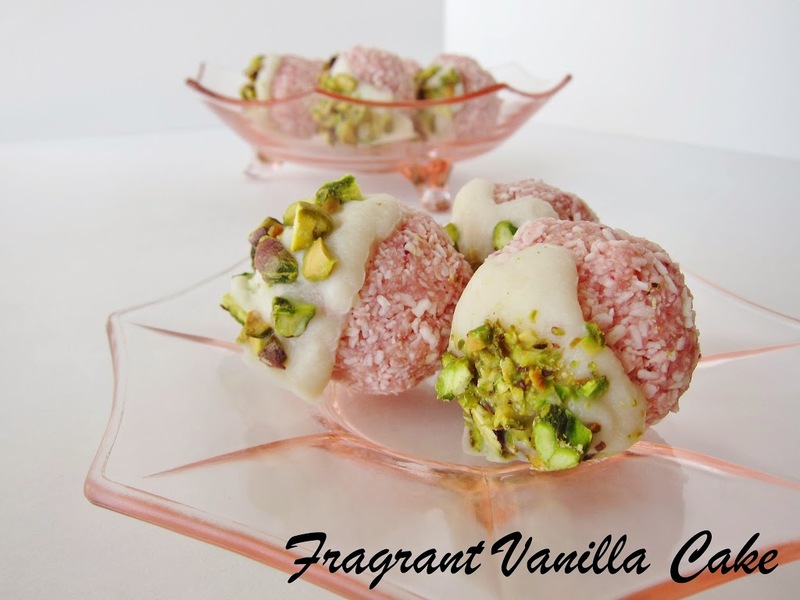 They were amazing...the sweet coconut, crunchy salty pistachios and aroma of rose. My Mom absolutely loved them! I think they would be perfect for easter as a bite sized dessert. Place almond meal, sea salt nectar, beet, rosewater and vanilla in the food processor and process until well combined. Add coconut and pulse until the mixture holds together. Form the mixture into 12 balls, and place on a dehydrator sheet. Dehydrate for about 12 hours, or until they are dried, but not so much so that they are not a little chewy in the middle. To make the glaze, whisk together all ingredients until smooth. 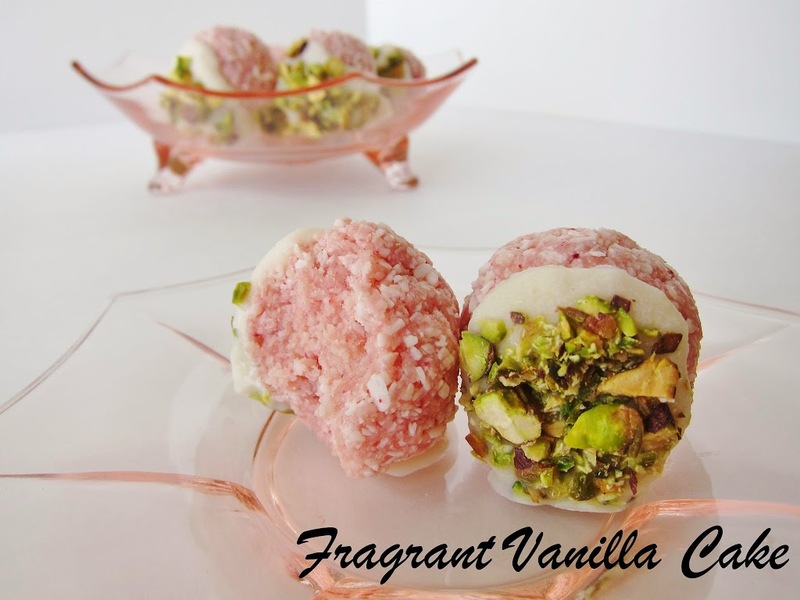 Dip a macaroon into the glaze, then dip it into the pistachios. Place on a foil lined baking sheet or plate. Repeat with remaining macaroons and once they are all dipped, place them in the freezer to set for about 5 minutes before serving. *I used soaked, skinned and dried almonds to make the meal. These are so beautiful!! I cannot tell you how much I appreciate your site: I love how beautiful the food photography is; I love how easy your recipes are to make (I have made more than a few of them); I appreciate that the portions in your recipes always work out (which can't be said of other sites I have tried); and I appreciate the imagination that goes into creating all of these recipes, which are a step above and beyond all other sites (especially raw sites) out there. Thank you! Thanks so much Brooke :)! I am glad you enjoy the recipes! I put them on the site exactly how I make them (or tweak them if need be to make them easier for you). I have fun coming up with things to make, so I am glad you appriciate the creativity :)! You could use coconut flour, simply grind shredded dried coconut into flour then use it in the recipe. I want to eat this page. Wow. That recipe looks amazing. I have been cooking and working with ingredients for <a href="http://www.jamescandy.com/shop-by-product/macaroons.html" rel="nofollow">macaroons</a> for years now and have yet to find the right one. Thanks for sharing! Thank you :)! I am happy to share, and I hope you do try them ;)! Thank you :)! It is 1 tsp, just fixed it! Hi Amy,<br />I must try this..it has my name on it. I do not have coconut butter or nectar..would you suggest I add more coconut oil? Hi, i love the recipe but unfortunately I do not own a dehydrator. Is there a way of making them without one? You can make them in the oven at the lowest temperature, they will just take a lot less time. (I would check them after a couple hours). It is to color them pink, so it is optional. Use a small chunk of fresh red beet. These are the cutest, sweetest li'l things. How did I miss them?